The Chinese military has deployed a new advanced short-range missile known as the DF-12 that was revealed for the first time in photos posted on the Internet this week. Disclosure of the missile follows publication of an Air Force National Space and Missile Intelligence Center (NASIC) report describing China as having the most aggressive ballistic missile development program in the world. "China has the most active and diverse ballistic missile development program in the world," the report said, highlighting 13 variants of short-range ballistic missiles, including five new short-range missiles systems. Beijing currently has deployed between 1,000 and 1,200 missiles opposite Taiwan, the island nation set up after China’s civil war that Beijing has vowed to use force to reunite with the mainland. The DF-12 missile was disclosed in a post on a Chinese website Tuesday. The posting on official state-run media described what had previously been called the M-20 for the first time as the Dong Feng-12. The shift in designation from M-20 to DF-12 indicates the missile is being deployed with China’s Second Artillery Corps, the service in charge of missile and nuclear weapons. It is not known whether the DF-12 will be armed with conventional or nuclear warheads or whether it is dual-capable. The DF-12 is a solid-fueled advanced short-range missile that China’s claims is comparable to Russia’s new short-range missile known as the Iskander, a short-range ballistic missile that Moscow recently said would be deployed in areas close to Europe, raising fears of new Russian military assertiveness. According to the online posting, the missile was discovered by visitors to the Chinese Space Museum in Beijing. The posting said the missile’s official range is between 62 and 173 miles but that its actual range could be as long as 260 miles. The missile has inertial navigation and Global Positioning System guidance. A model of the road-mobile missile with two-launch tubes was first shown at an arms show in 2011. Sen. Joseph Donnelly (D., Ind.) quoted from the NASIC report on China’s missile buildup during a recent Senate Armed Services Committee meeting, noting that the Chinese are "developing and testing offensive missiles, forming additional missile units, qualitatively upgrading missile systems and developing methods to counter ballistic missile defenses." The Chinese posting about the DF-12 stated that the missile would be difficult to intercept by missile defenses because of its range and speed. 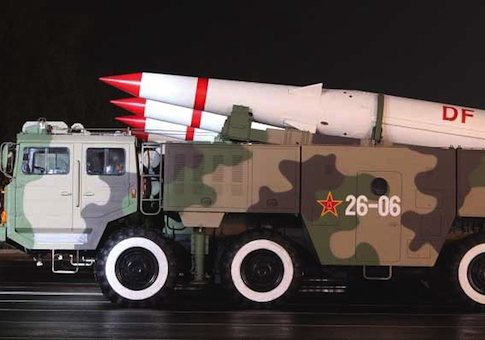 The DF-12 is believed to be the missile described in the NASIC report as the CSS-X-15, which has an estimated range of 178 miles, according to a Chinese military affairs expert. "PLA movement to deploy this new class of shorter range ballistic missiles stresses Taiwan by presenting a much shorter flight time, which can limit the ability of Taiwan's missile defenses to react," said Rick Fisher, an analyst with the International Assessment and Strategy Center. "Information from Chinese sales representatives and promotional materials also indicates these new short-range ballistic missile are maneuverable, which further complicates the task of missile defenses and can be armed with different types of warheads," Fisher said. "In PLA service it can be expected that some DF-12 class SRBMs will be armed with tactical nuclear warheads." China’s development of a new class of short-range missile is that it will add a new layer of threat to Taiwan. "These new short-range missiles are likely to be much cheaper to acquire than the 1,200 or so DF-15 and DF-11 SRBMs currently aimed at Taiwan," Fisher said. "The prospect for new growth in SRBMs aimed at Taiwan would significantly reduce the utility of Taiwan's current missile defenses and make it financially prohibitive to match China's increasing number of offensive missiles with defensive missiles." Taiwan currently has a limited number of Patriot anti-missile interceptors to protect the capital and some military bases. Fisher said the new Chinese short-range missiles are likely to spur Taiwan to invest scarce defense resources in developing offensive missiles to deter China. Reports from Taiwan indicate the island nation is developing a long-range cruise missile capable of reaching Shanghai. The Obama administration has begun to drop its longstanding opposition to Taiwan’s development of offensive ballistic and cruise missiles, according to U.S. officials. "But if the United States wants to continue to enable its allies to stress a ‘defensive’ response to China's missile buildup potential, then there should be far higher investments in energy weapons, like lasers and railguns," Fisher said. "These systems have the potential to allow a country like Taiwan to pursue a largely ‘defensive’ strategy that need not include high numbers of new ‘offensive’ missiles," he added, noting that U.S. defense spending cuts have meant fewer research dollars for energy weapons. The NASIC report said that the Chinese recently began deploying a new short-range missile called the DF-16, which has a range of about 124 miles. "China is producing technologically advanced ballistic missiles and has sold ballistic missile technology to other countries," the report said. "China has an extensive theater missile program and has deployed a large force of ballistic missiles in the vicinity of Taiwan."